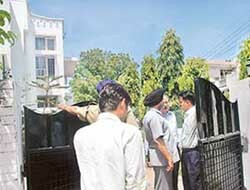 The top echelon of the Central Bureau of Investigation today conducted raids at the residences of two senior Punjab cadre IAS officers, Mr S C Agarwal and Mr K B S Sidhu, and two Indian Forest Service officers, Mr Harsh Kumar and Mr Jagjit Singh Samundri as a part of investigations into the Forest Hill Golf Resort case. Should fire safety clearance be made mandatory for all public functions? Dubbing Naxalism as the “single biggest internal security challenge,” Prime Minister Manmohan Singh today suggested setting up of joint unified commands in areas badly hit by Left wing terrorism and dedicated ‘wings of grey hounds’ on the pattern of Andhra Pradesh to tackle the menace. Iranian President Mahmoud Ahmadinejad on Thursday vowed Iran would not comply with demands from the West and the United Nations to suspend its uranium enrichment project. In a big relief to nearly 3,600 candidates who had qualified postgraduate (PG) medical admission test this year, the Centre today dropped its proposal to cancel the entire exam in the Supreme Court after the CBI found that the high tech cheating, due to which such a drastic step was contemplated, was mainly confined to Chennai centre. Coming out strongly in support of the reservation for Other Backward Classes in educational institutions, the CPM, supporting outside ally of the UPA government, today accused the Election Commission of applying double standards on the reservation issue. OPINIONS: Justice in three weeks! The Supreme Court today admitted a contempt petition against the Centre and the Punjab Government for their “failure” to implement its two judgements ordering construction of the Sutlej-Yamuna Link canal and tagged it with the Presidential reference on the validity of an Act passed by Punjab abrogating all water accords from 1981 onwards with neighbouring states. A local court today granted bail to filmstar Salman Khan in the Chinkara killing case and suspended his five-year sentence. The court also ordered Salman to deposit two bail amounts of Rs 1 lakh each and a surety of Rs 2 lakh apart from the penalty amount of Rs 25,000. Nepal’s King Gyanendra called for general elections in the Maoist-insurgency wracked nation in an address on the state-run media today. To develop Rajasansi international airport as a maintenance hub for aircraft and to meet the requirements of flight operations by 2020, the IAF has reportedly given its tacit approval to the Airport Authority of India (AAI) to shift its station from the airport complex to an appropriate site.